Hydroponics, growing plants in water plus fertilizer, has several advantages over growing plants in soil. 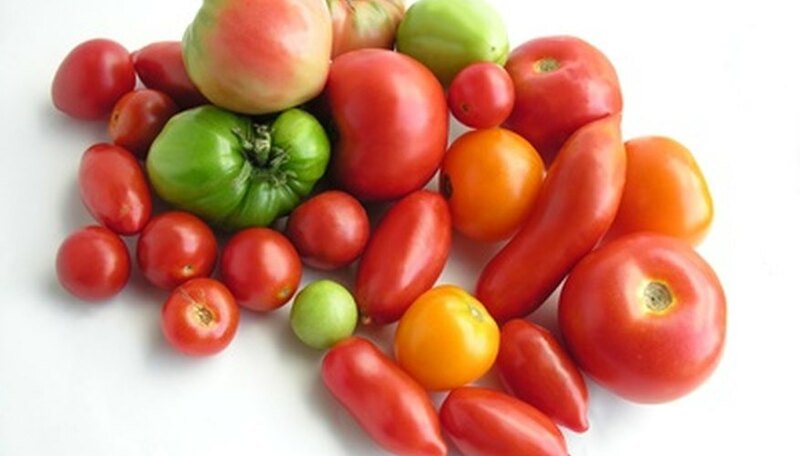 By growing tomato plants in water, you reduce problems with disease and pest control, make more efficient use of water and fertilizer, and end up with plants that bear fruit more quickly. One method for growing tomatoes in water involves an aggregate system, which means a substrate such as gravel or rockwool is used to support the plant roots. But all the nutrients the tomato plants need are provided in the hydroponic solution. Set rockwool cubes in plastic trays or on a surface covered with plastic sheeting. Sow two to three tomato seeds per cube. Sprinkle the cubes with granular rockwool to cover the seeds. Wet the grow cubes several times a day or as needed to keep them moist for proper germination. Keep the future seedlings in a location where the temperature remains between 70 and 75 degrees Fahrenheit. Apply a hydroponic nutrient solution to the cubes instead of water once tomato plants germinate. And make sure the plants receive eight to 10 hours of light per day. After the first true leaves emerge, thin seedlings so only the strongest seedling per cube remains. Two to three weeks after germination, place rockwool cubes with seedlings into growing troughs two-thirds full of gravel or rockwool. Make a hole for the cube, set it inside and fill around with gravel or rockwool. Space plants about 18 inches apart. Pump hydroponic solution into the trough so it is filled to about an inch from the top. Once filled, allow the solution to drain back out into the holding tank. Repeat this filling and draining of the tank two to three times per day, or as needed to maintain adequate moisture for tomato plant roots. A timer may be attached to the pump to automate this process. Change the hydroponic solution every 14 days to ensure that plants have adequate nutrients for proper growth. Support tomato plants with tomato cages as they reach about 8 inches tall. Set cages around each plant, tucking in leaves and stems to encourage upright growth.